When the Truckee-Donner Land Trust (TDLT) acquired the Royal Gorge properties in December of 2012 they knew full well that the properties had been neglected for decades and the forests were in a dangerous condition. Fortunately, they had the forethought to raise funds in addition to the purchase price for the stewardship of the land. 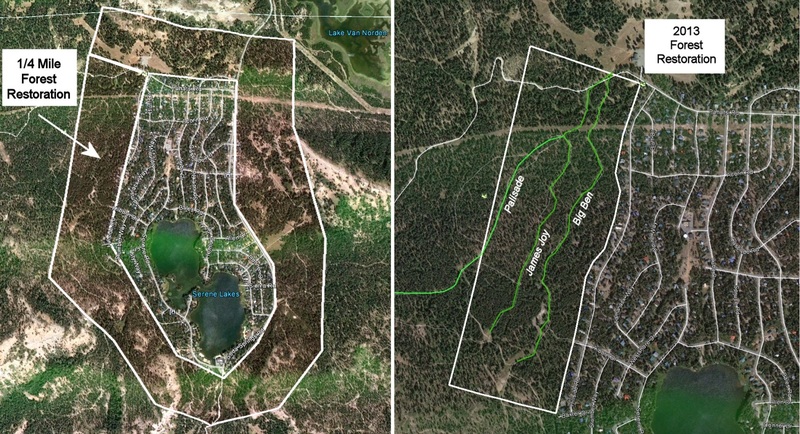 Early in 2013 they hired a consulting forester, Danielle Banchio, and after the snow melted she formulated an immediate forestry plan that proposed the creation of a ¼ mile buffer zone of restored forest (See Fig 1) around the Serene Lakes community as a protection against a catastrophic wildfire spreading into the subdivision (to see a discussion of wildfire threat click here). The plan was presented to the community in July of this year and was strongly supported by the property owners (to see the presentation click here). 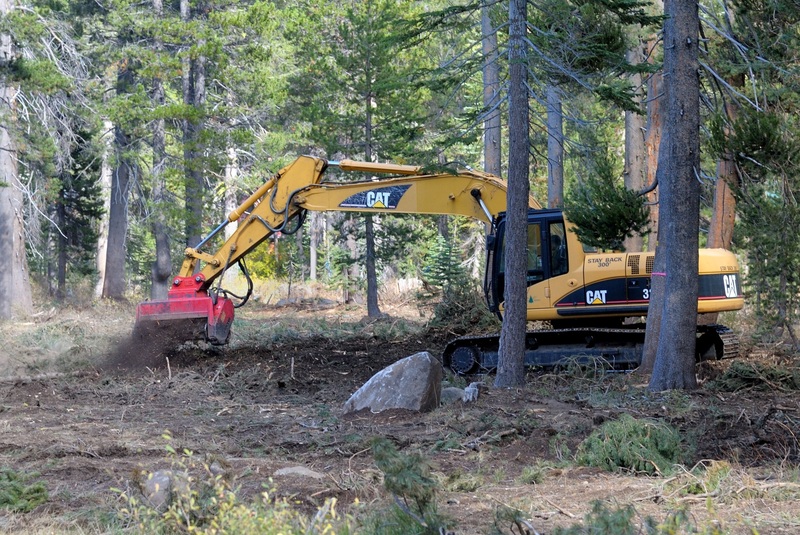 On Sept 3rd the actual work began by the contractor Robinson Enterprises located in Nevada City. 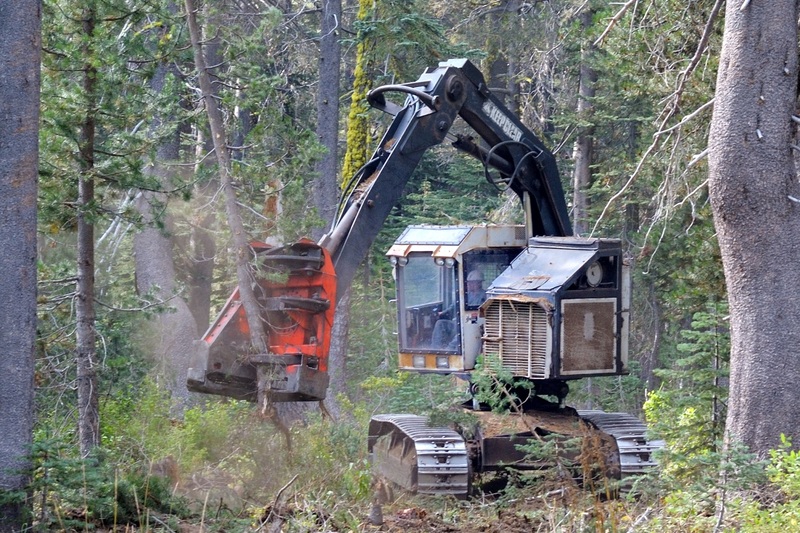 Restoring a forest these days means the use of very specialized logging equipment. The goal is to thin the existing forest which is severely overgrown to a healthier forest that would more resemble a forest produced by the natural forces of weather and fire. The first step, however, requires only a trained forester and a can of spray paint. During the summer of 2013, Danielle and foresters working with her spent many hours out in the forest on the west side of Serene Lakes identifying unhealthy trees to be removed. Those trees were marked with a sprayed on blue band. It is not surprising that given the status of the existing forest that there were more blue banded trees than bare trees after this part of the process. Figure 2. Feller-buncher cutting and stacking trees. The first piece of equipment that started work on September 3rd was an amazing machine called a feller-buncher (See Fig 2). This compact machine uses an articulating arm with a combination grabber/cutter to cut individual trees off at ground level and stack them in piles on the forest floor. 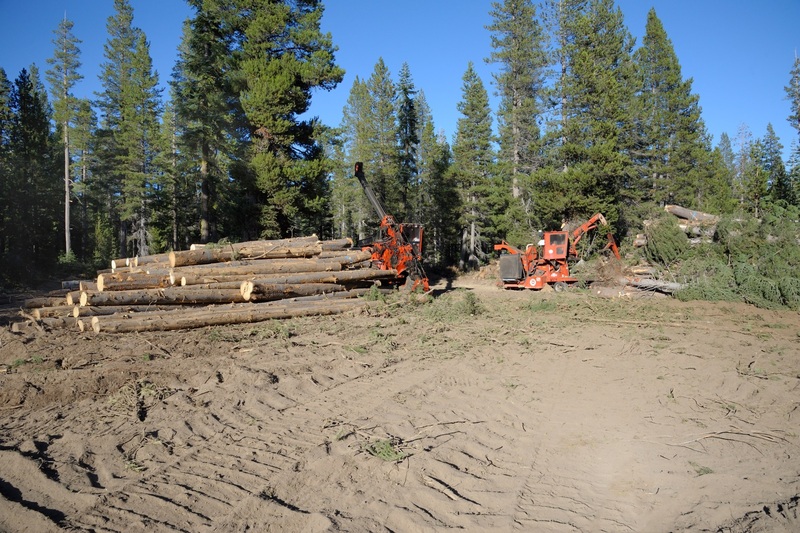 The feller-buncher methodically moves through the forest cutting and stacking all the blue-banded trees (to see the feller-buncher in action click here). The next step in the process involves the establishment of a “landing zone” where three more pieces of equipment are employed; a stroke delimber, an articulated crane and an industrial strength wood chipper. With these machines in place (See Fig 3) large tractors, called skidders, with large grabbing pincers, pick up and drag or “skid” the fallen trees to the landing zone. The crane sorts the trees into those that are good enough for saw logs and the rest which are chipped. The landing zone becomes a noisy, dusty place when the skidders are dropping off trees, the delimber is stripping the limbs off, and the chipper is filling large trailers that haul the chips away (to see the landing zone in action click here). Figure 3. Stroke delimber and chipper working at landing zone. Removal of the large trees is not the end of the process. There are still many small trees and thick underbrush left on the forest floor. Enter the masticators (See Fig 4). Equipped with an arm tipped by whirling grinders, the masticators chew every square foot of forest surrounding the trees down to the ground (to see masticators in action click here). The final result is a completely transformed forest of healthy trees that are well separated over a cleared forest floor. The foresters will then leave strategic areas of wetlands and snags to maintain wildlife habitat. While it may look a little rough in the first year, nature will quickly come back to reassert herself and in the coming years we should have a beautiful, healthy forest to enjoy. Figure 4. Masticators clearing the forest floor. Not only will the trees be healthier in the coming years with room to grow and good separation to prevent the spread of forest pathogens, but it will be a forest that will better resist the threat of wildfires. The Serene Lakes community will be in a much better position to defend against a catastrophic wildfire that could decimate the community with a ¼ mile buffer zone of restored forest surrounding the community. While it was the promise of preserved open space that garnered so much support for the acquisition of the Royal Gorge properties, the improved safety to the community may prove to be an even more telling reward of the TDLT acquisition. Figure 5. The almost finished product.